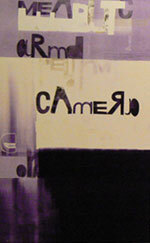 Magne's exhibition "Camera" is on display at Galleri Trafo in Asker until April. 24 "Foot Of The Mountain" was released to Norwegian radio stations. 25 The recording of Morten and Inez's appearance on the UK celebrity show "All Star Mr and Mrs" takes place (broadcast ITV 1, 30 May, 20:30, repeat ITV2, 31 May, 17:45). 29 "Foot Of The Mountain" premiered on UK Radio 2. 4 "Foot Of The Mountain" download only release in Norway. 19 a-ha are interviewed on the breakfast German TV show "Frühstücksfernsehen" (broadcast 20 May, Sat1). 21 a-ha perform "Foot Of The Mountain" (play-back) at the final of the German TV show "Germany's next top model" at the Lanxess Arena in Cologne (live broadcast 20:15, Pro7). 22 "Foot Of The Mountain" single release in Austria, Germany and Switzerland. a-ha perform at "The Dome 50" at the Olympiahalle in Munich, Germany (broadcast 30 May, RTL2). Other guests include Pet Shop Boys, Reamonn, All-American Rejects, James Morrison, Sunrise Avenue, Mando Diao and Scooter. 25 "Foot Of The Mountain" single release in Denmark. 30 Morten and Inez appear on the UK celebrity show "All Star Mr and Mrs" (recorded 25 April, broadcast ITV 1, 30 May, 20:30, repeat ITV2, 31 May, 17:45). 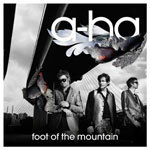 3 "Foot Of The Mountain" enters the official German Top 100 single chart at number 3. 5 a-ha peform 5 songs (The Sun Always Shines On TV, Riding The Crest, Foot Of The Mountain, Take On Me, Analogue) at the Arqiva Commercial Radio Awards in London. This is a radio industry event and is not broadcast. 8 Universal Norway host a "Foot Of The Mountain" listening party. 10 a-ha are in Berlin for some promotion. Morten is interviewed by Laut.de at the Regent Hotel. He also answers listeners' questions on the German radio station FFN. The band attend a Depeche Mode concert at Olympiastadion. 11 "Foot Of The Mountain" video premieres on German TV. a-ha hold a press conference at the Norwegian embassy in Berlin with photo session, "Foot Of The Mountain" video and questions. 12 "Foot Of The Mountain" album released in Germany, Austria and Switzerland. a-ha are back in Oslo to meet the Norwegian press at the Grand Hotel. 15 "Foot Of The Mountain" album released in Norway. Morten and Paul do some radio interviews, including NRK P1's summer show Reiseradioen and the P4 show "Ett-To-Tre". Magne is interviewed on NRK's P2 radio show "Mozart og Madonna". 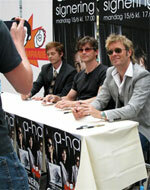 a-ha sign copies of their new album at Platekompaniet record store at Oslo City shopping centre (17:00). 16 Magne is guest on Radio 1's breakfast show. 18 a-ha do a live VG webchat (15:00). 19 a-ha perform four songs (The Sun Always Shines On TV, Riding The Crest, Foot Of The Mountain and Take On Me) at the free VG Top 20 chart show in front of the Town Hall in Oslo. The show is broadcast on NRK 1 and 2 via a live webcast from around 20:55. a-ha are on the cover of the free Norwegian magazine "MASSIV". Three different covers are available featuring Morten, Magne and Paul with in-depth interviews wurg each band member inside. 20-19 July An exhibition consisting of seventeen of Møller-Hansen's old a-ha pictures is held at Lillesand art gallery. 2 One Marylebone, London, UK. This exclusive event for the radio station Magic, in association with MORE TH>N, includes an evening of champagne, cocktails, dinner plus an exclusive performance by a-ha (The Bandstand, Riding The Crest, The Sun Always Shines On TV, Foot Of The Mountain, Analogue, Take On Me, Hunting High And Low). Tickets to this are only available to competition winners. 4-6 a-ha appear on several UK radio stations including "Forth One", "Lincs FM", "BFBS Radio" and "Wave 105". 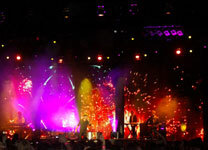 5 Magne attends the Roskilde Festival in Denmark where Coldplay are performing. 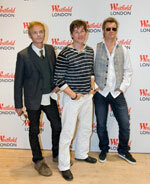 6 An interview with a-ha is broadcast on the show "Breakfast with Sim" on "BFBS" radio (09.00-10.00). 15 Morten and Magne are on "National Lottery Midweek Draw" (22:35-22:45, BBC1). 16 An interview with Morten and Magne is broadcast on "Real Radio 106-108FM". 17 Morten and Magne are interviewed on the morning TV show "GMTV" (re-scheduled from 6 July). The band members are asked questions sent in by fans during a love video webcast after the main show (09:30).
? Morten and Magne choose records on Magic Indulgence 105.4. 18 Morten and Magne are interviewed and perform an acoustic version of "Foot Of The Mountain" on Gethin Jones' show on BBC 5 Live. Martin Terefe accompanies them on guitar and xylophone. Morten and Magne appear on Gary Crowley's show on BBC London (recorded a few days earlier). 19 Morten and Magne are interviewed on Magic Indulgence 105.4 (19:00-20:00). 20 "Foot Of The Mountain" download only single release in the UK. 21 Morten and Magne are guests on James O'Brien's show on the London radio station "LBC 97.3". 22 Magne and Morten are interviewed by Dale Winton on UK's BBC Radio 2. 23 a-ha perform an acoustic set on George Lamb's show on BBC Radio 6 (re-scheduled from 3 July). 24 a-ha perform "Foot Of The Mountain" and "The SunAlways Shines On TV live on the talkshow "Friday Night with Jonathan Ross" (BBC1). iTunes Festival, Roundhouse, Camden, London, UK (The Sun Always Shines On TV / Riding The Crest / Cry Wolf / Scoundrel Days / The Bandstand / Stay On These Roads / Hunting High And Low / Summer Moved On / Manhattan Skyline / Foot Of The Mountain / Analogue /The Living Daylights / Train Of Thought / Take On Me). A very short clip of "Foot Of The Mountain" is broadcast during the itunes highlight show on Friday 31 July on ITV2. 25 a-ha perform 7 songs (The Sun Always Shines On TV / Riding The Crest / Foot Of The Mountain / A Question Of Lust / Take On Me / Analogue / Hunting High And Low) on Dermot O'Leary's show on BBC Radio 2. "BBC Shropshire broadcast an interview with Morten and Magne. 26 a-ha take a day off from promotion. 27 "Foot Of The Mountain" album released in the UK. a-ha are interviewed on "BBC Breakfast" and they also appear on "BBC News". The interview with Morten and Magne by doyouremember is broadcast on "Hope FM". 28 In the morning, a-ha are interviewed on "Sky News". a-ha perform "Foot Of The mountain" and "Hunting High And Low" in Westfield Shopping Centre, West London (13:00) and then head to HMV to sign copies of their new album (rescheduled from 13 July and different venue). 29 Norway's ABC Nyheter has a video report from Westfield Mall, London. Italian TV also report on the event. 31 The Norwegian TV show "Sommertid" (TV2) has a report from Tone Lise Skagefoss who followed a-ha in London. A telephone interview with Morten is broadcast on BBC Radio Scotland. Morten is interviewed on "Smooth Radio". 2 "Foot Of The Mountain" enters the UK album chart at number 5. 4 Morten and Magne appear on the Janice Long show on UK's BBC Radio 2 (recorded a few weeks previous). 6 SWR3 sponsored radio show, Engers Castle, Neuwied, Germany. a-ha and Simple Minds perform in front of around 1600 competition winners. The set list is the same as itunes, but the songs are played in a different order. The TV channel, ARTE is streaming the concert live. The show is webcast live and broadcast on radio / TV on 22 August. 9 Morten performs two solo songs, including "A Change Is Gonna Come" at the Haydon meeting in Vennesla. 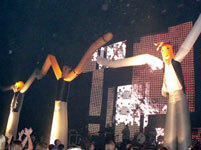 He also performed with Harket Mannssangforening. The money raised from the event goes to Haydom Lutheran Hospital in Tanzania. 14 a-ha perform two songs ("Foot Of The Mountain" and "Take On Me") at the opening show of the "World Championships in Athletics" at Brandenburger Tor, Berlin, Germany in front of an audience of 10,000. "Foot Of The Mountain" is chosen as the official song of the Berlin championships held 15-23 August. NRK broadcast some footage from the soundcheck and interviews with the band. 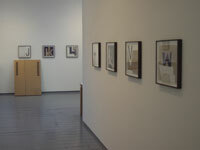 30 Magne's exhibition "Camera" opens at Hugo Opdal's gallery in Flø. 11 a-ha are guests on the Norwegian talkshow "Senkveld" (TV2). They are interviewed and perform the new single mix of "Shadowside" (playback). 19 a-ha perform four songs at the SWR's New Pop Festival at Festspielhaus, Baden-Baden, Germany where they receive the "Pioneer Of Pop" award for their "outstanding position in pop music". The show is broadcast on "ZDF" on German TV on 3 October. a-ha are interviewed by ZDF at the show. 21 A remix of "Nothing Is Keeping You Here" is released in the UK. 23 Morten performs 15 songs (A Change Is Gonna Come / Mitt Hjerte Alltid Vanker / O, Jesus Du Som Fyller Alt I Alle / Spanish Steps / A Kind Of Christmas Card / Songbird / Natten / Elisabeth Synger Ved Johannes Døperens Død / Engelen / Grandma's Hands / O, Bli Hos Meg / Movies / The One You Are / With You - With Me / Lay Me Down Tonight) in front of an audience of 600 people at Kirkelandet Church, Kristiansund. His band included Kjetil Bjerkestrand (keyboard), Helge Norbakken (percussion) and string quartet Alexander Robson, Bård Monsen, Anders Rensvik and Ole Eirik Ree. 24 Morten and Magne are guests on the UK TV show "Live From Studio 5" (Channel 5). 26 Morten and Magne are interviewed on Sky Sport's "Soccer AM". They wear personalised Stoke City football shirts. 28 An interview with Magne is published on the football website "4TheGame.com". 1 Magne and Heidi attend the premiere of Margreth Olin's new movie "Engelen" ("The Angel") at the Colosseum in Oslo. 2 The video for "Showdowside", directed by Uwe Flade premieres on German TV "VIVA". 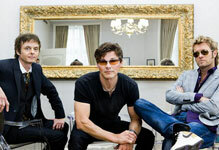 11 Morten and Magne are interviewed on the UK music channel "BLISS". 15 Magne's exhibition "Alpha Beta" opens with a private viewing at the Paul Stolper gallery, London. Heidi flies over to join Magne for the opening. a-ha announce they will split up after next year's world tour. Magne is interviewed on TV2's 9 o'clock news about his exhibition and the split. In the afternoon, Savoy's drummer, Frode Unneland, is interviewed on the TV news channel "TV2 Nyhetskanalen" about a-ha's break-up. 15 Magne's "Alpha Beta" exhibition opens at the Paul Stolper gallery in London. Magne and Heidi attend the opening event. The exhibition runs until 21 November. 16 Tickets go on sale for the final a-ha concert on 4 December 2010. The show sells out the same day. "Shadowside" is released in Germany. 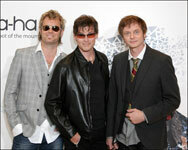 21 a-ha perform "Nothing Is Keeping You Here" and "Foot Of The Mountain" playback on " Die Ultimative Chartshow" (RTL). "Nothing Is Keeping You Here" is broadcast during the "Most successful comebacks" on 27 November and "Foot Of The Mountain" is broadcast during the "Most successful hits of 2009" on 4 December. 26 a-ha hold a press conference in Cologne in connection with their break-up. 4 O2 Arena, London, UK. The video for "Nothing Is Keeping You Here" premieres on the German website MyVideo.de. 5-8 The 2009 IFPDA Print Fair takes place at The Park Avenue Armory in New York. Paul Stolper has booth A18 which includes work by Magne F.
6 Spektrum, Oslo, Norway. Gallery Benoit in Boston, USA has its grand opening (6-9pm), the exhibition features works by Magne Furuholmen amongst other artists. 11 Ancienne Belgique, Brussels, Belgium Morten and Paul are interviewed for Belgium TV. 13 a-ha performed "Nothing Is Keeping You Here" (playback) on "Nur Die Liebe Zählt" on German TV "Sat1" (broadcast 22 November). 20 Ice Palace, St. Petersburg, Russia. "Nothing Is Keeping You Here" is released in Germany. 25 JCB Hall, Tokyo, Japan. While in Tokyo, a-ha are interviewed by the radio station FM Yokohama. 28-23 Dec Prints from the Alpha Beta series are on display at Galleri Trafo in Asker, Norway as part of a Christmas exhibition. Magne's art is included in a group exhibition at Kunstgalleriet in Stavanger, Norway. 05 Magne's Alpha Beta exhibition opens in Lillehammer. Magne arrives at the exhibition three hours late. 09 Some of Magne's Alpha Beta artwork is exhibited at the interior design showroom at Vinderen in Oslo. 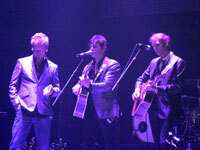 12 a-ha perform at a corporate Christmas party for employees of Media-Saturn at Stadtheater, Ingolstadt, Germany. Other artists performing include No Angels, Peter Maffay and Sunrise Avenue. 24 Magne is voted the 9th best dressed man in Norway, chosen by 18 people from Norwegian fashion and published by the Norwegian newspaper "VG". 26 Pre-order of a limited edition (1000 copies produced) 7" vinyl of Apparatjik's "Electric Eye" begins on theoutland.com website. 30 Radio Devon broadcasts an "Ending On A High Note" a-ha special in which Richard Green chats to the band about the end of a-ha.